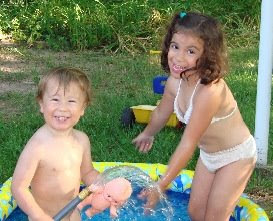 Livin life naked in your backyard splashing and running doesn't sound like a bad deal. Splash, little children, splash. LOL!! I thought that it looked like he was naked!! I'm with you... Why waste the money? We just put Erik in his swim trunks, so swim diaper, and hope for the best! LOL! 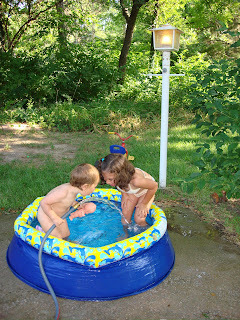 We don't use diapers either in the backyard pool. I just throw a suit on him (we live right on a corner, so who knows what pervs are lurking. Oh, the fun of drinking out of the hose! Lookie Lookie who's nakied! LOL SO cute!